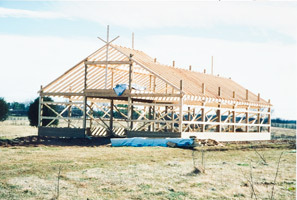 The barn was built in 2000. 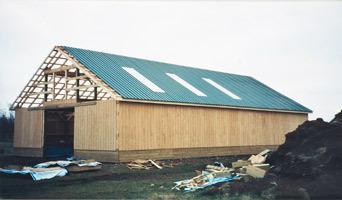 Evergreen is very proud of its barn, due in part to the innovative airflow pattern it encourages. With cross ventilation and vertical ventilation the horses are kept cool in the summer as well as comfortable without stale air in the winter. In 2000, the farm was also fenced and cross-fenced and one run-in shed and a temporary round pen was built. Three more pastures were fenced and another two run-in sheds were built to better realize the benefits of rotational grazing. The round pen was also made permanent with solid oak walls with sand footing. Larger parking areas and trailer parking areas were added. The horses were better protected with an automatic gate opener to safely contain all horses on the property, while allowing boarders to enter and exit the farm without leaving the warm dry comfort of their cars! Automatic waterers were also added in three fields. This was a busy year! A new climate controlled tack room with heat and humidity controls and was added, in addition to new storage for blankets, fly masks and all the other equipment horse people are known to accumulate. The heated wash stall with excellent lighting, clean fiberglass paneling (easy to clean and disinfect if necessary! ), blanket drying racks and hot and cold water was also added. The feed room was also upgraded to include new cabinets, additional counter space, and excellent feed storage. In the barn, blanket racks were added to the front of each stall, and the packed dirt flooring in each stall was covered with rubber mats. Dusty wood shavings were also eliminated in favor of virtually dust-free pelleted bedding. While 2003 was busy, 2004 was the busiest year yet. Rubber crumb footing was added to the round pen to give joints a break from the circular pounding of roundpenning and lunging. Its also an excellent place to start youngsters! A docking area and ramp for the manure spreader was built to keep it close and accessible to the barn, while keeping the area safe for people and animals. Three additional fields were fenced bringing the total to ten and making rotational grazing a reality from early April through late October. By far the biggest physical enrichment was the addition of a new indoor arena. After careful consideration and a year of researching, the farm opted to install a “Cover-All” arena. Its natural light and lofty feeling is a welcome addition to the indoor experience. The ceiling height, at twenty-nine feet, gives an almost outdoor feeling. The footing in the indoor is a sand mixture over a 4-inch layer of compressed mulch. With non-harsh additives mixed into the sand combined with the mulch sub-footing we have found a way to keep the dust away. The indoor was complete with the addition of lights. Since the indoor ring was built on the site of the old outdoor ring, a bigger and better outdoor ring was also constructed. Built by 4 Points Excavating, the ring has a very precise rise that is unnoticeable to the horse and rider, but which drains very well. A limited amount of rubber crumb was also added to the ring. Trailer parking and turn-around was also made easier with the addition of a gravel turn-around. The 80-foot plus radius is a boon to all trailer drivers, as well as our farm owners and boarders when they arrive home late, weary from traveling or showing! Finally, a new hay and storage building was constructed to protect the farm’s high quality hay. Although the major efforts were all in 2004, in 2005 and 2006, Evergreen Farm made minor, but important improvements to the farm. The aisle was fully matted with rubber mats to decrease dust and give professionals such as farriers and vets a level, dust-free area to work. Additional lighting was placed on the barn and in strategic locations around the farm. This year for Evergreen farm was spent primarily on the road. We decided to head out and show the world the quality, talented horses we have for sale. Taking our stock out on the road enabled us to prove the quality of the breeding, the quality of the training and most of all, the quality of Evergreen Farm as a whole. It worked; we sold several horses, got new boarding clients and picked up a new trainer along the way. After new rings are created they have to be given time to settle and produce a solid underfooting. After 5 years of use the indoor and out door rings were ready to have the final layers of footing added. The indoor had much of the old sand removed (it breaks down after time) and new sand put in. The outdoor ring had some new sand added with a look to early 2010 several loads of river sand to be mixed in to create a softer surface during those hot dry months of July and August. An additional stallion paddock was added to the back of the barn. 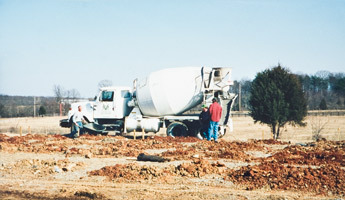 The construction of a new FULL SIZE dressage arena was begun. In July we added AIRFOOT footing to both the indoor and outdoor arenas. AIRFOOT is ground up athletic shoes, when this granular mixture is added to existing footing, it reduces concussion rates and adds cushion (or ”cush”) and spring to horses steps. It also prevents packing and traps moisture and dust. The top riders, in all disciplines, use this footing, and it is highly recommended. In 2013 Evergreen Farm made a huge upgrade to its facility. We decided that it was time to add an additional arena. 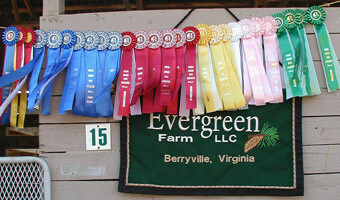 We were in need of a full sized dressage arena for both our own training and showing goals as well as the farm's. We opted to build, on the opposite side of the driveway from the current arena, a 200X100 full sized dressage court. It is flanked by railroad ties all around to keep the footing secure and in place and then fenced outside of that with a short but divisional web fence. This was in keeping with our desire for people to continue to feel comfortable bringing young, newly started horses, who may otherwise decide to "leave"! We completed the picture by planting almost 100 evergreen trees, deciduous trees and shrubs around the NW side for all year color. We joke here at the farm that between the indoor, the smaller arena and the new court we are officially "A 3-Ring Circus"!. Seriously, we love the availability this new arena give us for Pas de deux's, musical freestyles and the ability to possibly hold combined tests in the future. It also allows the trainers that support us to bring their upper-level horses and compete as well. and cannot be used without written permission from Evergreen Farm, LLC.